We sat down with Kiri, creator and owner behind The Honey Bagger to interview her and her small business. Hi Kiri! We’re so glad to have you! Can you tell us about yourself and your business? My name is Kiri and I live in Pickering, Ontario in Canada. My parents are British, I was born in New Zealand but have lived pretty much my whole life in Canada. I have been married for almost 10 years to my husband and have an amazing almost 20 year old son. My business is called The Honey Bagger and I create custom purses, makeup bags, hats and more. 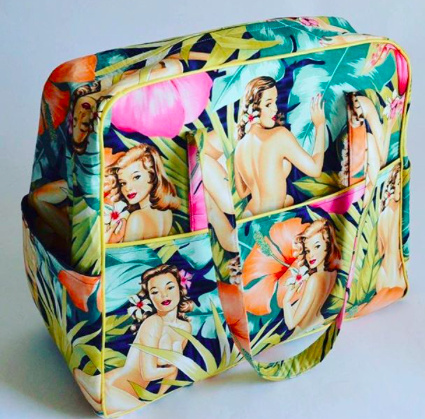 I try to find unique fabrics that will “speak” to my customers, that way I can ensure that their new purse will be a true reflection of their personal style and a truly unique creation. I have more recently started to pair my fabrics with sparkle vinyl to really help them pop! I actually went to school for physical anthropology, and had planned to go into forensic anthropology (picture the TV show Bones)...but then I had my son while I was in University and started working for a bank...which is so completely different from what I do at The Honey Bagger! I have always been creative and when I was younger I loved drawing, making things with FIMO and sewing. My mum taught me to sew many, many moons ago and I even ended up sewing mine and my sisters prom dresses! So other than what I learned from my mum, I am pretty much self taught. I officially opened my Etsy shop back in 2011, but I didn’t really get going with it until a few years later. That said even now I probably don’t focus on it as much as I should. It can definitely be hard trying to balance a full time job, multiple side hustles and family life. I started The Honey Bagger for two reasons....on one side I looked at it as a way to allow my artistic side out and let me create things, and on the other side it was a way to help give my family a little extra income. I started very small and I can’t thank my my parents enough for helping me out, they bought my first really nice sewing machine (a project runway brother machine...which I loved) but also my old roller derby teammates from Durham Region Roller Derby for supporting me back when I was getting started! Looking back on some of the things I used to make really helps me to realize how much I have learnt over the years from both a design and sewing perspective. This is where I probably still need to do a bit more learning and get myself out there. I don’t like to “push” my products and always feel like the right people will find me. But given that there are so many talented creators out there, in truth it can be hard for people to find any one maker. I rely a lot on word of mouth and I do have a loyal following of people that love my creations. My goal for 2019 is to focus more on social media so that I can reach more people. But I must say that it can be hard to reach people when Facebooks and Instagram control how many people your posts reach, unless you are willing to pay a lot of money. This really does make it hard for small businesses! In the next year my main goal is to participate in the One of a Kind Christmas show! I have been many times as a customer, but would love to be featured there as an artist. Beyond that I want to grow my business a bit, I’m actually not looking to quit my day job as I love it. I love the balance of the bank, which feeds my analytical side and The Honey Bagger which feeds my creative side. One thing I do plan on focusing on in 2019 is setting up a schedule for myself, so that I can better balance work, sewing and family. When I’m at The Day Job I find myself thinking about all the things I would be sewing if I was at home, but then when I’m not home I get distracted by all the things that need to be done in the house, or...let’s face it Netflix! Wow.....in the next ten years? I guess I would like to steadily increase my sales, but again not too big or too quickly. I am hoping to retire in under 15 years (woo hoo Freedom 55) and I would love to be able to do more with The Honey Bagger at that point. My dream is to have a little farmhouse with a few animals, and having an online shop is something that I can take with me anywhere I go! From a marketing and sales perspective I think that changes in technology and more so the way in which we interact with it and with each other through it has really exploded the reach that small businesses have to their clients. It is now possible to run a small shop out of your home and reach clients just about anywhere in the world, with an ease that would have been impossible not that long ago. As I mentioned I live in Canada and I have sent my creations to Greece, Germany, Estonia, Australia and Israel! I talk to friends, family, other makers and definitely my customers. I don’t tend to follow trends (not sure if that is good or bad), I just do my own thing. I do think it is important to always challenge yourself and your skills or it is very easy to become stagnant. So if I see something that I want to try but I’m not sure how to approach it I will try and find someone that is currently doing it and reach out to them for help and guidance. Most of the time people are more than willing to share their knowledge! I’m also thinking about getting a SkillShare membership to help increase my knowledge about marketing and more of the business side of things. As a creative person I do tend to get sucked into the creative side of things and don’t focus enough on the actual business-y side of things. Know your skills, your limitations and follow your dreams, don’t just follow trends as they will come and go. Be true to yourself and value every single customer that you have, even if its only a few. I honestly believe it is better to have a few true followers/customers that really value what you are creating than a hoard that likes your creations just because they are “cool” in the moment.